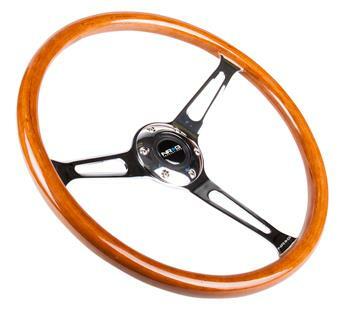 NRG Steering Wheel - Vintage Wood Series UNIVERSAL - Lesher Motorsports, Inc. The Wood Edition Series are made from high quality materials with sophisticated designs to let you feel the smooth luxurious wood, soft supple leather, elegant chrome finish, or thematte finish. Available in 330 mm to 360mm.